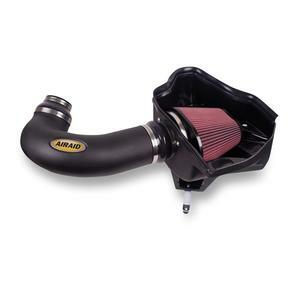 AIRAID MXP Series Cold Air Dam Intake System; SynthaFlow; Incl. Intake Tube; Easy To Install w/Basic Hand Tools. The SynthaMax air filter has two layers, an inner and outer layer of wire mesh for durable support of filtration which helps prevent the air filter from collapsing under high air flow. The inner layer consists of two layers of synthetic materials that both provide outstanding air flow (low restriction) and high filtration. Particulates are first trapped in the outer layer of synthetic needlefelt polyester material designed for wet and dry filtration with high air flow capacity. The inner layer of (wet-laid / chemical bonded) (rayon / polyester) captures any remaining particulates while maintaining high air flow and low restriction. The AIRAID® Synthamax air filter is made completely of synthetic fibers, is washable and does not need to be oiled which makes clean up easier. The true benefit to this air filter is its lifetime no hassle warranty and Airaid's unique filter design. SynthaFlow is Airaid's original oiled air filter design. They use multiple layers of cotton gauze combined with the Synthaflow layer, a unique synthetic material, to catch almost twice as many paticulates as the traditional paper air filters. These layers of material are formed and held in place by a durable epoxy coated wire mesh with a unique ridge design. These ridges and valleys in the air filter are then coated with AIRAID's air filter oil to help catch even more particulates. The oil is applied after cleaning the filters every 30K - 50K miles with AIRAID's air filter cleaner.